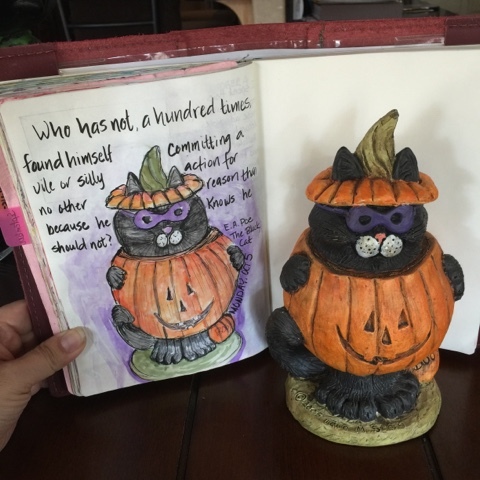 Continuing with the Halloween theme, my Inktober entry for today is another decoration I have. I drew this with my Platinum Carbon pen and since there are lots of carved markings on the actual piece, it was perfect for a loose sketch. I then used my Koi watercolors to color. 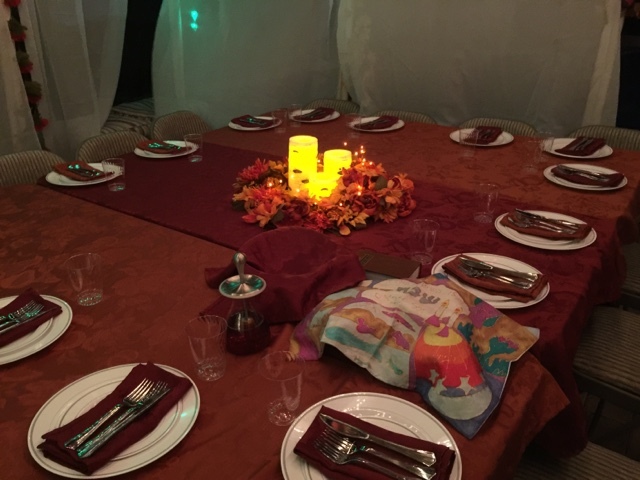 Last night, we were invited to celebrate Sukkot with friends. 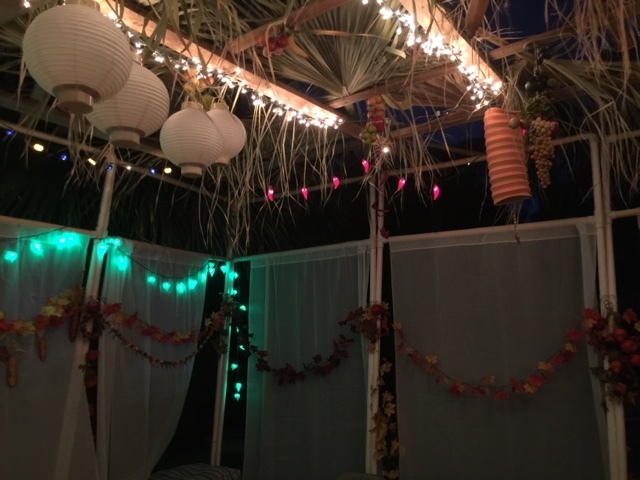 They had built a beautiful sukkah with PVC pipes and decorated with lights, palm leaves, leaf garlands and lanterns. It was actually not hot so it was very pleasant to eat outside. Our friend, Mary, always has delicious foods prepared. And her apple challah is so very good. 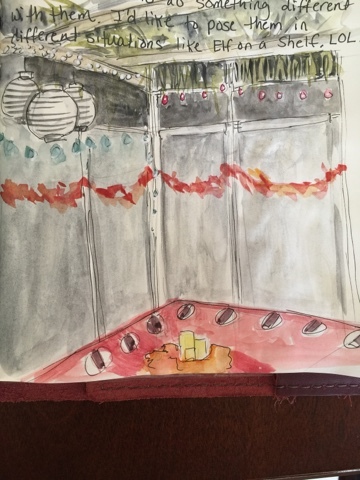 I had to do a quick sketch of the sukkah..
For those of you reading who may not know about Sukkot, it is a Jewish holiday that reminds us of what it was like to live a nomadic life like Jews after escaping Egypt under the cruel Pharoh's rule. It's also one of the festival holidays so we celebrate the fall harvest. There is some evidence that the American holiday of Thanksgiving was fashioned after Sukkot. We make a temporary dwelling outside, with four walls but the roof is only partially covered so that we can see the stars. Typically it is decorated with fruits and vegetables and homemade decorations. During the seven days of Sukkot, you are supposed to dine inside the Sukkah and some will sleep in the sukkah. We had a great meal (we always do when Mary is cooking) and an even better conversation. This is a really interesting celebration that I wasn't fully aware of. I had heard the term but had never understood. What a wonderful thing to do with friends and family to remember the ways of the past. We've never made a sukkah for us but we are glad that some of our friends do. It's a fun holiday to share with friends and family!